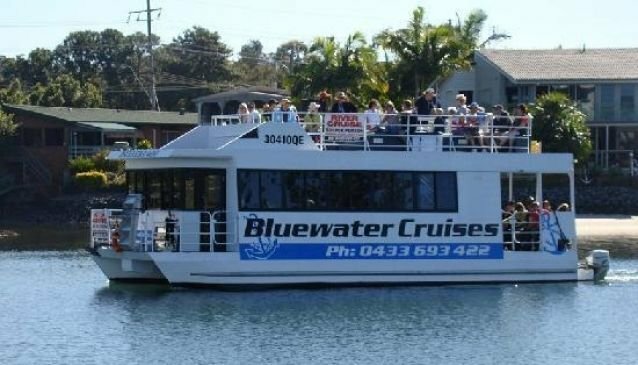 Blue Water Cruises offer daily cruises with 4 scheduled departures from Surfers Paradise with each cruise having a duration of 90 minutes, taking in the Gold Coast waterways and canals. There is covered indoor seating with an upper deck sightseeing sundeck being the perfect place to take photos of the Gold Coast. The Morning and Afternoon Tea Cruise include tea and coffee with a selection of cakes offered. Lunch Cruise and Sunset Cruise offer a sausage sizzle barbeque. All meals/snacks are included in the cost of the cruise. Beer, wine and champagne can be purchased on board.